If google doesn't know it, how should i? Your cake looks fantastic! Thank you for letting us know how yummy it was! Thanks, and no probs. I was quoted £200 for a really basic 2 tier cake from one of the cheapest basic bakeries in our area, and it didn't look half as nice! I'm really glad i chose the asda cakes in the end. It saved us a load of money and everyone loved it I was really worried incase it looked 'cheap' but worked out great. Wow - it looks great and works out even cheaper then M&S! Thanks for the tip. 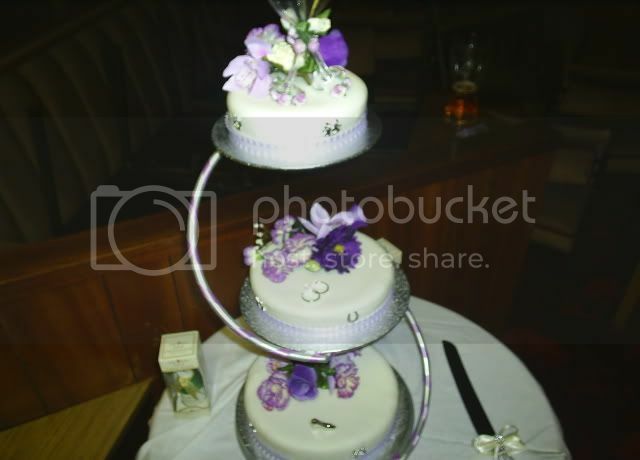 Congratulations on your wedding - your cake is gorgeous by the way. Fantastic cake - what a great bargain. looks much more expensive than the price you paid - Good to know it tasted good too. I don't suppose anyone knows if Asda do a sponge cake in the Extra Special Range as I was hoping to have 2 tiers of fruit and 1 tier of sponge. Also do they do the cutting blocks? P.s Niknaknoo the cake looks gorgeous. Fabulous!!!! There's a wedding cake programme on the Wedding channel around 9pm. It really is great for tips! !